KX-TDA30 – Panasonic’s KX-TDA30 is a hybrid IP PBX system designed to fulfill a customer’s requirements today and into the future. It can be configured to meet their present needs and expand as their applications grow or change. It has a maximum capacity of 12 CO lines and 24 extension ports. KX-TDA50 – Panasonic’s KX-TDA50 is a hybrid IP PBX system designed to fulfill a customer’s requirements today and into the future. It can be configured to meet their present needs and expand as their applications grow or change. It has a maximum capacity of 8 CO lines and 24 extension ports.. Initially configured for 4 CO lines and 4 propietary extension ports (7600 Series Phones). Includes power supply, RS232 port, USB port, Music on Hold port, paging port. KX-TDA100 – Panasonic’s Hybrid IP PBX system is a powerful communications tool designed to support businesses in today’s Converged Networking age. Reflecting on Panasonic’s 20 years as a leader in the field, the Hybrid IP PBX system merges PBX functions and reliability with IP technology. The result is a high-performance business communication system that provides advanced telephone messaging solutions, efficient and flexible communications, Wireless Mobility, IP Networking capability, Voice-Over IP, and seamless integration with your PC through plug-n-play USB Connection. In line with Panasonic’s commitment to user-friendly operation, the Hybrid IP PBX system is easy to use even without a lot of IP experience. KX-TDA200 – Panasonic’s Hybrid IP PBX system is a powerful communications tool designed to support businesses in today’s Converged Networking age. KX-TDA600 – Panasonic’s Hybrid IP PBX system is a powerful communications tool designed to support businesses in today’s Converged Networking age. Panasonics new pure IP PBX delivers an all in one converged IP platform, it is a true converged system for today and the future. 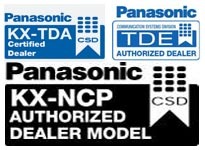 The design of the KX-TDE100 and KX-TDE200 is based on the Panasonic KX-TDA100 and KX-TDA200. The KX-TDE cabinet accommodates both KX-TDA power supplies and most KX-TDA circuit cards. However, the KX-TDE is a converged system that offers pure IP connectivity via a network or Ethernet connection that resides on a new main processor card. This allows the KX-TDE to be configured as a pure IP system, as a traditional system or both—allowing the customer to migrate to IP at their own pace. The KX-TDE supports expansion with analogue, Digital & ISDN, Network with other systems, making them ideal for customers planning to expand into a VoIP Solution in the future. Enhance your business with a solution designed to meet your needs, with mobility, network applications and a common infrastructure that can connect to your users, wherever they are Easy-Smooth Migration is the key for customers upgrading to Converged solutions. KX-TDA100/200 systems can easily be upgraded to take advantage of all the new benefits. Manage a single, or multiple systems from any location, and benefits from lower costs, and increased business productivity. All of the Panasonic KX-T7000, 7200, 7300, 7400, 7600, 7700 and the NEW KX-DT Proprietary telephones will work and are compatible with the KX-TDA 50, KX-TDA100, KX-TDA 200, KX-TDA 600, as well as the KXTDE Series systems, also the NEW KX-NCP 500 & 1000 so if you already own a Panasonic system with one of these phone series it will be inexpensive to migrate to the KX-TDA,KXTDE, or KX-NCP system without changing out all the telephones. You can choose from a variety of Panasonic KX-NT series IP telephones, Panasonic IP Softphones, third party SIP hard/soft phones, as well as earlier Panasonic proprietary IP phones, digital and electronic phones. A new KX-NT300 Series introduces three wired IP telephones with Bluetooth headset compatibility, backlit displays, speakerphone, two Ethernet ports and support for Power over Ethernet (PoE) and the G.722 codec for high sound quality. The most advanced model, KX-NT366 (pictured), has 48 self-labeling CO Line buttons. Two new 2.4GHz multi-cell cordless handsets, KX-TD7694 and KX-TD7684, allow employees to communicate while away from their desk, but within the cell coverage area.